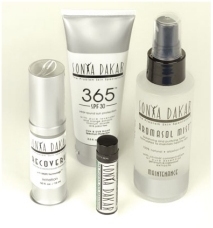 Protect your skin this season with the new Summer Essentials Collection by Sonya Dakar. The line includes a lightweight SPF 3O sunscreen, a moisturizing SPF 15 lip balm with hemp and olive oil, and a post sun care treatment to promote cell regeneration. SonyaDakar.com, $80.